As the 2016 election campaign attests, the Grand Old Party—once moderate and even magnanimous—has fallen into a prison of its own making when it comes to presidential politics. After the debacle of the George W. Bush presidency and the rout of the Romney candidacy, Republicans said they must broaden their base, become more inclusive, and return to the warmth of Reagan idealism. Instead, what we have is a bitter, backbiting, and race- and gender-baiting campaign with a candidate more exclusive than any before him. How did we get here and how do we get out? 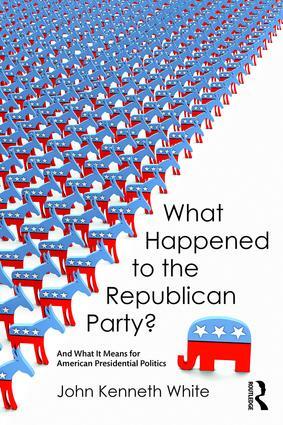 This book tracks the modern history of the Republican Party and shows its decline, even while shining a light on its high points and urging it back in a positive direction. Every reader interested in the US presidential election, the primary process, and the clash of politics and culture will find something enlightening in John White’s exposition. Above all, he puts the Age of Trump into perspective, looking back as well as forward in his analysis. 1. Current. Anticipates the current state of the Republican Party, at odds with itself as much as with the American public. Includes 2014 midterm election data with an eye toward the 2016 presidential contest. 2. A broad historical sweep. Covers a broad historical period from the 1950s (Eisenhower era) to the present, with a strong emphasis on the Reagan years which represent the GOP at its zenith. 3. Efficient use of polling and demographic data. Takes a broad swath of historical data (including polling data) and presents it in a condensed, readable format. At the same time, the reader is not inundated by polling and demographic data. 4. Bold. Any reader will come away from this book understanding that the GOP predicament is likely to last for some time to come. The problems Republicans face are both intellectual and political. They are not likely to be solved by any one candidate or election and will be compounded and confounded by the events of 2016. Introduction: "I Can't Sell My Kids on This Party"